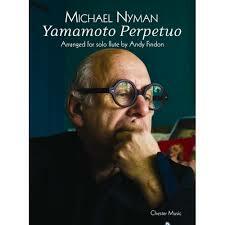 Michael Nyman, Yamamoto Perpetuo for Solo Flute: transcribed & performed by Andy Findon. Best known for his film score for The Piano, Michael Nyman is acknowledged as “one of Britain’s most innovative and celebrated composers.” In 1993, he was commission by designer Yohji Yamamoto to write a piece for a fashion show in Paris. Nyman wrote the piece, named Yamamoto Perpetuo, for solo violin, and then, following its success, re-cast it as his String Quartet No.4. Nyman is not only a composer, however, he also leads a band put together to perform his compositions. As a long-term member of that group, London-based flutist Andy Findon has a deep appreciation and understanding of Nyman’s music, and he drew upon this to write an arrangement for this piece for solo flute. His own recording of the piece, presented here, will undoubtedly remain, in every way, the most definitive. I worked from the quartet score, rather than the violin solo, as it had developed into a chamber piece, with more material to use. I realised that for what was to be over half an hour of solo flute there had to be enough varied and contrasting sounds to maintain interest for listeners, particularly those who may not be familiar with the “Nyman” style. My chair in the band is baritone sax doubling flute & piccolo, a multiple role, sometimes driving the bass line, along with bass trombone and bass guitar, as well as playing lines with the high strings when I change to the flutes and being a part of the 3 piece sax section. I decided to apply techniques from all of these disciplines to this project. I was also determined that this should be a performable piece, rather than a book of virtuosic studies. Stamina and breathing issues were a major concern. I have varied the order of the 11 movements from the original with this in mind. 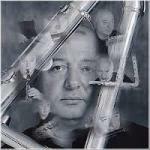 Findon has told me, on more than one occasion, that doubling interferes with the development of an ideal flute embouchure and technique, but I would defy anyone to identify him as a doubler in a blindfold test. His flute work, as revealed in this performance, is impeccable, and this piece, full of melodic intricacy, rhythmic complexity, dynamic contrasts and subtly shaded variations of timbre, would be a challenge for any flutist, At the same time, no one should be put off by this description; Nyman is a master of the genre, and the complexity which becomes apparent to performers preparing his work, is subsumed under an aesthetic that makes the work far more attractive to an audience than many similar contemporary works. True, solo flute music, especially a minimalist piece that lasts a half-hour, can make excessive demands upon a listener, but the combination of Nyman and Findon has created something that everyone can enjoy, and flutists will want to explore.